We are right sizing industry after industry to what consumption SHOULD be, not what it WAS. What will that post super credit bubble world look like? What would a world of 1997 or 2002 level credit look like? Where do you think state, local, and federal taxes will be in 2 years? 5 years? 10? to pay for all we are promising? Is anyone paying attention to the structural global changes that are happening under the surface that are (mostly) unstoppable? That said, just because this is a punishing era for American labor, does not mean capital (and thus stocks) cannot enjoy profits and the stock market can benefit. [Jan 12, 2010: Jim Cramer is Right] But let us stop the nonsense about Main Street = Wall Street. The flattening of the globe, means continued global wage / labor arbitrage - especially among the middle and working class. It's the era of capital, not labor. For Americans to compensate, deflationatiornay measures need to be allowed to happen in the country, to put costs back in line with incomes. [Aug 18, 2009: Bloomberg Opinion - Deflation Theory is Lemon We've Been Sold] Instead both the federal government and Federal Reserve are doing everything in their power, and layering countless more debt on our children to increase costs (prices). Which is part of the reason we got here in the first place (massive credit expansion i.e. debt - was needed to keep up with the growing costs caused by "beneficial" inflation, as income increases for the middle class began to falter over a decade ago). Indeed, inflation is the most regressive of all 'taxes'. Eventually the market will overwhelm these not so "invisible hands", but in the meantime they continue to do incredible damage - all under misguided economic precepts that have become consensus. The idea that layering on more debt for future generations so as to regressively tax the lower tranches of society today... and that's a good thing... as economic gospel is beyond me, but I'm in a tiny minority. 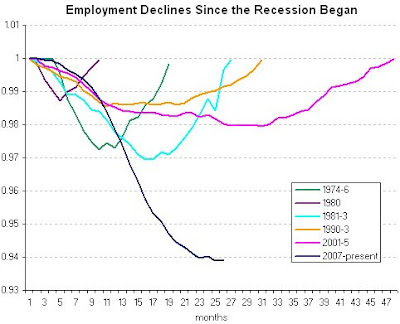 Viva la jobless recovery of the ages. [Aug 14, 2009: No New Normal Say Some Economists, Prosperity Without Jobs?] Since we are almost out of private workers to get rid of to maintain a functioning economy (still need our Walmarts, bars, and lawyers), and stimulus after stimulus is being issues yearly to protect those in the public (pseudo or otherwise) sector - more hemorrhaging of jobs seems almost inconceivable. But at this point in the business cycle we should not even be having these sort of discussions... we should be asking if the US economy is going to create 300 or 400K jobs this month? And I don't mean census workers, or fake jobs created in the birth / death model (only to be revised away a year or more later). Economic recovery? Tracking quite nicely to my predictions in Dec 2008.